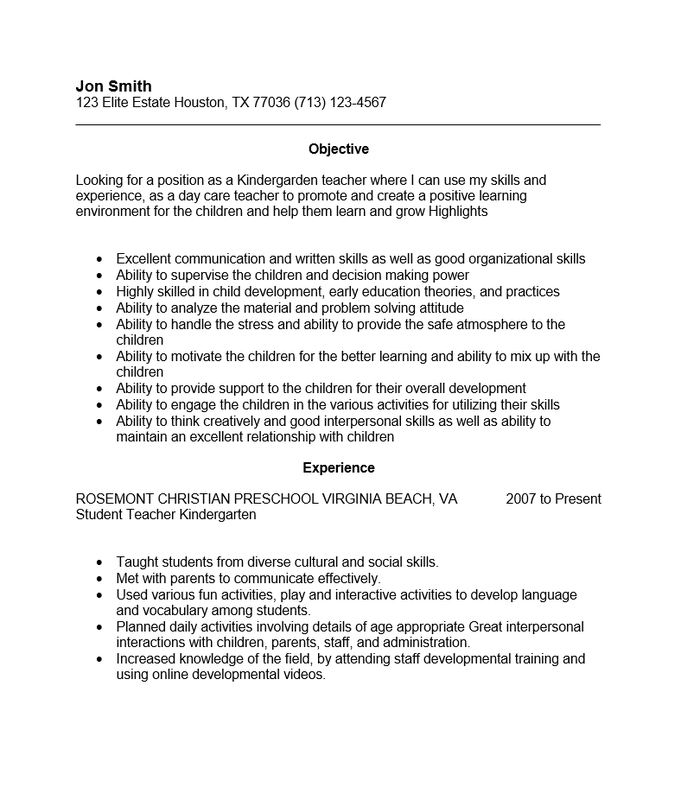 The Kindergarden Teacher Resume Template serves as a structural aid for kindergarden teachers on the job hunt. This profession will require certain attributes from a candidate. For instance applicants should have excellent communication skills with both very young children and adults, a knowledge of education, the law, the ability to retain control in large groups, and an overall understanding of developmental psychology. Delivering the amount of information required to gain an interview as efficiently as possible will increase the likelihood of winning that interview. This is the ultimate goal of any resume. 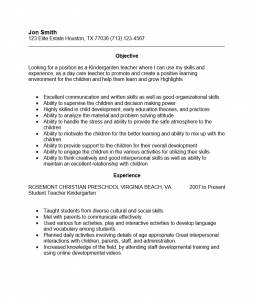 While the structural format of the kindergarden teacher resume Template provides the benefits of an organized job search, it is the content that recruiters will decide upon. As such, users are encouraged to organize their thoughts and records when filling this out and also to proof read once done. It is highly recommended to gear the content toward being straightforward and that a fair amount of care be taken to show off one’s command of this profession’s jargon. Step 1. The first section will be for your name and contact information. Generally, it is a good idea to format this similarly to a business card (where the name is prominently displayed just above the address, phone number, and email). Step 2. The Objective section should be roughly two to four sentences. In this section, you should make a statement about your intention and keeping your goals crystal clear to the reader. If possible mention the experience and skills you are bringing to the table. This may also be in a bullet list however the section should begin with an introduction. Step 3. The Experience section will be a detail of your employment history. For each relevant position you held report the place of employment, location, date range you were employed for, the official title of your position there, and a synopsis of your accomplishments there. The synopsis may also be in a bullet list however the place of employment, location, date range, and official title should not. This information would be considered a sub-heading containing the list of accomplishments and/or duties. Step 4. The Final two sections “Education” and “Certifications” will list your credentials (academic). The “Education” section should deliver the degree title you earned, where you earned it, and when you earned. The “Certifications” section is specifically for any training certificates you have achieved.